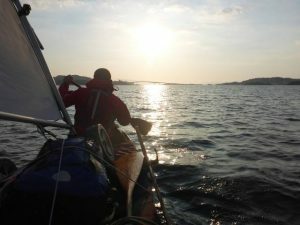 In April 2017 retired Halifax Police Inspector Colin Skeath set off with his nephew, Davis, to circumnavigate the UK mainland in an open Canadian canoe. 86 days later the journey of around 2500 miles was complete. On Wednesday 15 November come along to Mixenden Activity Centre to catch up with Colin and hear the story of how this massive feat of endurance was planned and executed, taking the fearless pair though many dangerous tide races, over falls and whirlpools, not to mention having to contend with the British weather! “A fantastic, entertaining, serious, enjoyable, informative talk. Anyone with an interest in canoeing or adventure travel ought to hear the story.” Andy Carden, Newcastle. Tickets are FREE but there is a suggested donation* of £5 for adults which will go towards Colin and Davis’ chosen charity, Forget Me Not Children’s Hospice. The evening also includes a buffet supper. The Forget Me Not Children’s Hospice supports children with life shortening conditions and their families. They currently support more than 185 families and could support many more if they had the funds. They need to raise £3.8 million each year to continue this support with almost all of their funding coming from the community. Thank you for supporting Forget Me Not.